Perhaps you’ve noticed a small or large bump beneath the skin of your foot. It may be painful, but not always. Foot tumors and cysts can develop for many different reasons, but they should always be looked at by a foot specialist to determine what type of growth it is and how to proceed with treatment. This will alleviate any concerns you may have and also ensure proper and swift treatment of the condition. Cysts are sometimes described by different names. You may have heard of gangalion cysts, or perhaps the terms synovial, cutaneous, or mucoid. While they sound different, these types of cysts are essentially the same. Basically, a cyst by any name is a pocket of tissue filled with non-cancerous fluid. When pressure is applied, it might feel like a pea rolling around beneath the surface of your skin. While not always painful, they can be if they are pushing against a nerve or joint. Causes: A cyst can develop around a foreign body within the skin. It can also be the result of an infection or clogged sebaceous gland. In addition, cysts can branch out from joints and the lining of tendons, and are believed to sometimes form as a result of small repetitive injuries over time. Treatment: Sometimes cysts will disappear on their own. Other times cysts may need to be lanced or drained. This is usually done by numbing the area and drawing out the fluid with a syringe. Sometimes a steroid or hardening agent is then injected into the cyst to try to prevent it from filling again. Medications can also be injected, and if all else fails, cysts can be surgically removed. Don't hesitate to contact Savannah Orthopaedic Foot & Ankle if you are experiencing any abnormalities or pain in the feet. Tumors are different than cysts in that they involve an abnormal growth of tissue that can be harmless (benign), or cancerous (malignant). 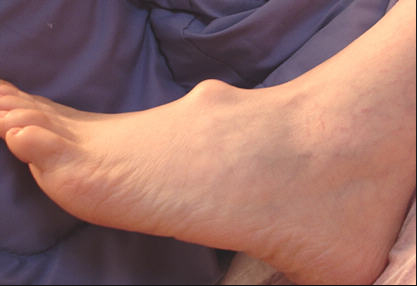 Foot and ankle tumors can develop in the skin, soft tissue, tendons, bone and cartilage. Causes: Tumors become more common as we age, and it is thought that heredity plays a part. Beyond that, the causes are unknown. Benign tumors like warts make up approximately 95% of foot or ankle tumors and can be the result of a virus. Other examples of benign tumors include Nevi, such as moles and birthmarks, and a colored growth on the skin called eborrheic keratosis. Treatment: Tumor tissues can be scraped away by a procedure called curettage and electrodesiccation. A surgical excision involves cutting the skin and surgically removing the growth. A less invasive approach is cryosurgery, which is a procedure where liquid nitrogen is used to freeze and destroy the affected tissue. Magnetic Resonance Imaging (or MRI) is often necessary before a biopsy and/or surgery is performed.